Hello LosAngeles - HOLLYWOOD SIGN WALK TO THE TOP! HOLLYWOOD SIGN WALK TO THE TOP! Join me for a Walk right to the TOP of the Hollywood Sign! I'll guide you up the best path to get to the sign while entertaining you with fun historical facts and stories having to do with one of the most recognizable signs in the world. I do a morning hike and an evening hike for the sunset hour! In addition to storytelling, I've curated this hike to give you the best pictures for your Instagram and memories for a lifetime! I'll help you get the best photos of the sign, the skyline, and other scenic panoramas that will make your social media light up with likes--I GUARANTEE at least 10 LIKES on instagram :). You can follow me along @hollywood.hikes. I'll show you how to take once in a lifetime photos in the absolute best locations throughout Griffith Park including a stunning panorama from above with the sign in the background and Los Angeles below. Don't miss out on the most iconic attraction on the West Coast! We'll start promptly at the allotted walk time. We'll walk 10 minutes to the 1st Photo Stop while I give you some history of Griffith Park and the Hollywood Sign. From there, we'll walk another 15 minutes through the beautiful Hollywood Hills neighborhood in route to the 2nd Photo Stop where we get to do a variety of different poses including my favorite "Jump" Picture--Great for Instagram. Lastly, we'll track through the middle of Griffith Park in route to the top of the Hollywood Sign - I'll be sharing stories about the surrounding area and my own personal Hollywood Stories! 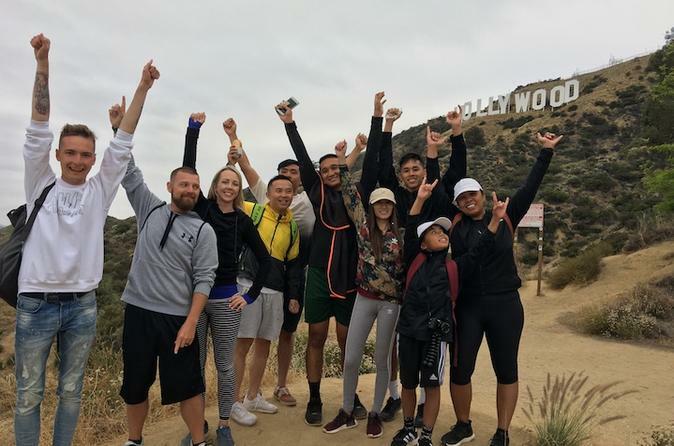 At the top, we'll be rewarded with breathtaking views of Burbank and the San Fernando Valley as well as all of Los Angeles -- including Downtown LA, Hollywood, Century City, Beverly Hills, Lake Hollywood Reservoir, Miracle Mile, and even Palos Verdes on clear days! On the way down, I'll happily share with you my favorite bar, restaurant, tourist recommendations to insure you have the best and most pleasant hike possible. Better than a guide, let me be your new local friend in LA and help you discover the very best this city has to offer!